Hotel Park Oasis in Nessebar Beach resort in Bulgaria. Book a summer beach holiday online. - 10% discount until 15 May 2018. - 7=6, 14=12, 22=18 for arrivals during the periods: 01 May - 15 June 2018; 10 Sept - 30 Sept 2018. * Extras can be combined with Early bookings. Location: The three star hotel complex "Oasis" is located in the new part of the town of Nessebar, right over the sea and there are only a few steps from the east entrance of the park to the beach. Accommodation: The hotel offers 48 double rooms and 23 hotel suites. All rooms and suites have air conditioning, cable TV, telephone, refrigerator and 24-hour service and security. All of them have balconies. - The double rooms in Hotel Park "Oasis" are equipped with pleasant and comfortable wooden furniture. All rooms in the eastern part have a beautiful view to the park and the sea. They offer two regular and one additional bed. - The suites in "Oasis" are a good solution for your family vacation. They have a comfortable living room and a separate bedroom. 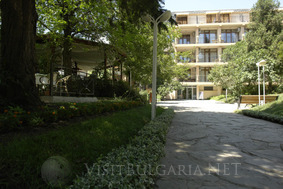 Wine & dine: The main restaurant of "Oasis" offers an impressive menu of Bulgarian and European specialties. The restaurant has a spacious indoor hall with a winter garden and a fireplace, as well as a lovely summer terrace among the beautiful greenery of the park. It is not surprising that the restaurant is a preferred place for weddings, family celebrations and official events. The water bar of Hotel Park "Oasis" is the place where you can drink your cocktail and enjoy the incredible combination of sounds – children laughter, splash of water and bird songs. Bistro "Oasis" offers delicious traditional dishes, Italian specialties and selected drinks, together with a view to the lively central street of Nessebar. This is where our guests have delicious lunch or dinner before they start on a shopping tour in the Old Town or indulge in the night life of the resort. Sports & recreation: The sport center of "Oasis" was completely renewed and modernized in 2005 and immediately won good reputation and many faithful clients. It offers modern fitness equipment, massage, sauna, solarium and the services of professional masseuses and fitness instructors.